jQuery Mobile is a plugin for jQuery that provides convenient and easily-implementable mobile-designed web content. It is touch-optimized and strives to make web content easily interactable for users with a touch device. JQM is compatible with all major mobile platforms as well as most desktop browsers. The developers of jQuery host a web-interface called Themeroller which allows the user to customize the colors and styling of the mobile HTML elements . When JQM is included in an HTML page, all compatible HTML elements are automatically converted into mobile styling. JQM also provides additional components to developers by providing easy-to-use dialog boxes and pop-ups, although this is not easily compatible with Backbone.js. The framework provides a client-side routing system very similar to Backbone. For this project, we chose to use Backbone’s routing system, but we could have converted the project over to use JQM’s routing system. We felt that the styling of mobile elements was too forced in some situations and could be very hard to restyle differently. JQM does not simply add CSS classes to elements: sometimes it nests content in layers of divs, spans, and other elements. It can become very annoying to decipher how JQM formats an element, but it is necessary in order to customize the styling in any major way. Currently, the formatting horrors of jQuery Mobile seem to be a necessary evil. Besides those problems, JQM is a very fast and easily implementable tool to aid in the field of mobile web development. The following images display our usages of jQuery Mobile in the project. jQuery UI is a plugin for jQuery that attempts to improve the aesthetics of the user interface by using elements that respond to user input. Three of the parts of this library that were explored during this project were “draggables,” “droppables,” and “sortables.” A group of HTML elements can be created into a “sortable,” which allows the elements to be dragged into different orders. Draggables are the same concept, except that the HTML element can be dragged anywhere within the container element, window or body, depending on settings. Typical settings for both draggable and sortable include: revert, an option to force the element to return to its original position along with the duration of the animation, appendTo, the HTML element that the element can be manipulated in, and helper, an option to move the original element on drag or make a copy of the element to move, leaving the original. Events include create, drag, start, and stop. During the entire process of making the tasks drag and droppable, we tried having them all be draggables. We discovered later that we wanted to keep all of the tasks organized and switched to “sortables.” Later in the summer, we saw an example of the other elements drifting to fit around the one being dragged, causing us to change the entire way the task elements move. Instead of making all of the task divs draggables, the individual div becomes a draggable object on click. The other elements move around it when it is dragged, and, when the dragging has stopped, the draggable is destroyed. 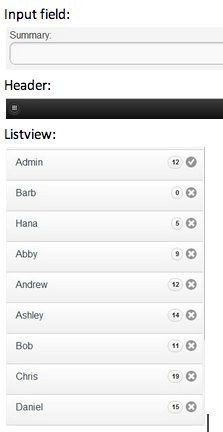 Droppables were also used as the user list on the manage page to allow the tasks to be reassigned to a different user by dragging and dropping. All that was required to make the user list “droppables” after calling droppable() on the HTML element was to define which elements can be dropped onto them, what should happen when an accepted draggable is over a droppable, and what should happen when an element was actually dropped, i.e reassign the task . JQuery UI caused problems when we tried to make all of the elements drift around.